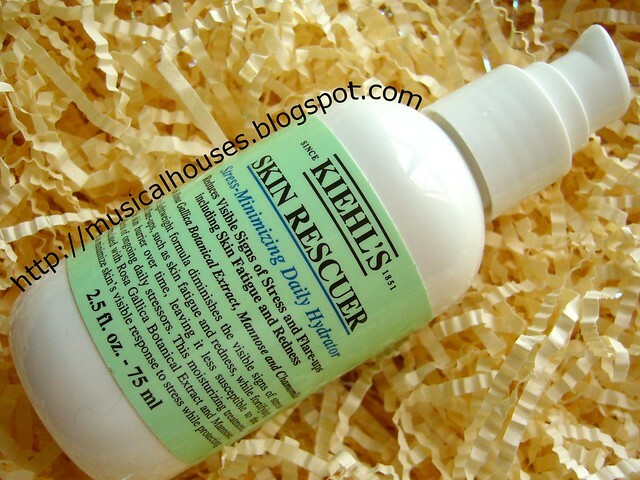 The Kiehl's Skin Rescuer was launched a few months ago during summer, as a daily moisturizer for stressed, sensitive skin. Stressed, sensitive skin, you say? Awesome! If you read my skincare posts with any regularity, you'll know that while acne is a major problem of mine, a secondary, related problem is that of skin sensitivity and redness. Although my skin isn't that sensitive, it does sometimes experience redness and irritation. So I was keen to try this to see if it would work for me. And although I was all, "Pfft, another moisturizer, how boring," now that I've been using this for a few months, I have to say, I am actually impressed! Stressed, sensitive skin? 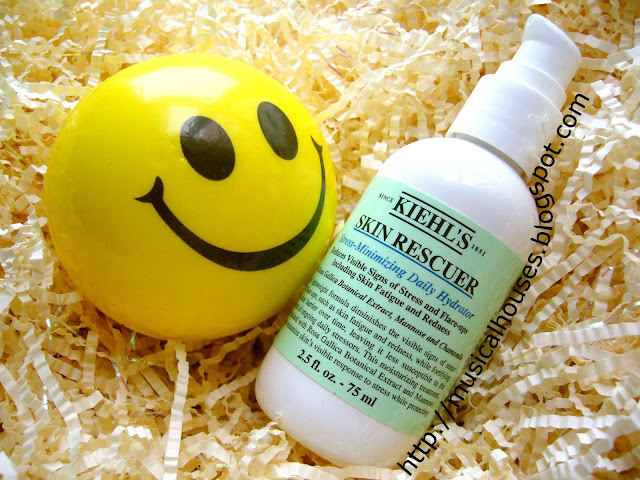 The Kiehl's Skin Rescuer might help! You guys know that in addition to my own experience with the product, I also like to start off my reviews with a little ingredient analysis. So let's begin! First off, I do think that the ingredients generally offer good hydration for everyday, while alleviating sensitive skin. The ingredient list starts off with a host of moisturizing ingredients, including glycerin, squalane, caprylic/capric triglyceride, and shea butter. All of these are a good mix of familiar, solid moisturizers that are backed by the scientific literature and are staples in the skincare industry, and will definitely keep skin hydrated. None of these are comedogenic, so that's another plus. This is in line with my experience using the product. When I first started using the Skin Rescuer, I was a little worried about the shea butter being too heavy for my skin at first, but I've been using this product for a few months now, and my skin is fine with it. A good range of ingredients that moisturize the skin as well as help it improve its barrier function. Naturally, the entire mixture can end up being rather thick in texture, so there is also the addition of solvents, such as propanediol, to keep the product cosmetically elegant and un-gooey. The result is a cream that when used, has just the right texture for a moisturizing cream - it's creamy and substantial, but not too thick or oily-feeling. It does sink into the skin, and works well under makeup too, from a cosmetic elegance perspective, this is pretty good as a moisturizer that offers a great level of hydration while being easily assimilated into your daily routine. Don't be fooled by the comparatively lightweight texture, because the Skin Rescuer does do some serious hydration. There are also of course the plant-based ingredients which Kiehl's advertises as helping to calm skin redness and irritation (mannose, rosa gallica flower extract, and chamomile flower extract). While I'm sure most people will like the plant extracts, what really excited me about this product was the inclusion of ceramides and sphingosines. 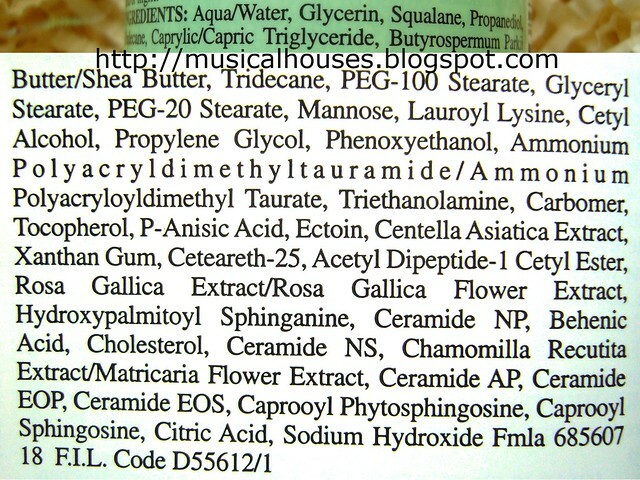 If you read my previous review of another ceramide-containing product, the Elizabeth Arden Ceramide Capsules, you'll know that ceramides (in conjunction with other synergistic ingredients such as sphingosines and cholesterol) can be helpful in helping to replenish the skin's barrier function and decrease skin sensitivity and dryness, especially if the loss of barrier function is due to a drop in ceramide level due to skin conditions (such as atopic dermatitis, psoriasis, or contact dermatitis), or just plain ol' aging or sensitive skin. So although it's not a major ingredient in the product, it's definitely nice to have, and it will be a nice bonus for those who have sensitive or easily irritated skin, since the ceramides help to repair the skin barrier too. I did find that when I used the Skin Rescuer, the general condition of my skin improved as a whole, probably as a result of the improved skin barrier. All in all, a lightweight cream that offers strong hydration, and repairs sensitive skin. So, after all this ingredient analyzing and personal reviewing, would I recommend this product? Yes, I sure would. Not only is it in a sanitary packaging (pump dispenser, woo! ), and fairly value for money at 75ml, it is also, in terms of formulation, a solid moisturizer with nice extra ingredients that will help to calm skin and improve the skin's barrier function. While I do think most skin types would be able to use this without issue, I also think that if you have sensitive or easily irritated skin, this is worth checking out. Hi! i know this is unrelated to the post but i really hope you'll answer my question! i recently bought the chamos acaci trouble skin solution and matte pore primer over qoo10 and i analyzed the ingredients on a website cosdna.com . It stated that the ingredient butylene glycol and zinc oxide had the potential to cause acne. A cursory search online on butylene glycol reveals confusing results. Some say its harmful and causes acne, others says its safe to use. You also mentioned in an earlier post the zinc oxide is probably one of the active ingredients. If so, is it really a potential cause of acne? Do ingredients like Stearic Acid and Retinyl Palmitate(vitamin A) also have the potential to cause acne? @vanessa: Sure, I can help to answer your question, no worries :) Both butylene glycol and zinc oxide are safe for use in skincare products and are very unlikely to give you acne. I've looked up the cosdna site before too, but I've found the accuracy of their ingredient ratings to be hit-and-miss. Some are accurate, some are not. To be honest, I'm not sure why they rated both butylene glycol and zinc oxide are quite well-established in terms of safety. I suspect it is because butylene glycol is a type of alcohol, and online there is a lot of scaremongering about how alcohols are bad for your skin and dry it out etc (not all alcohols dry out the skin, and also it depends on how the product is formulated). For zinc oxide, I'm not sure why the site would claim it causes acne. Both are fine. Stearic acid has some potential to cause acne, but it is not extremely comedogenic. So you might or might not be fine with it, depending on your skin. Retinyl palmitate is actually a weaker version of retinol, which is known for its anti-aging effects, but also can cause sensitivity in some skin types. Since retinyl palmitate is weaker, there should be less likelihood of skin aggravation. But if your skin is more sensitive, it may be good to do a test patch. @vanessa: Welcome, let me know how it goes! Looks like it is going well so far! Nice product! I hope this can also be good for oily sensitive skin. Hello I read both your reviews on Daily Reviving Concentrate and Skin Recuer, but i dont really get wich one works best. I have dry skin that tends to get dry and opaque during the day, speccially under stress or winter..son hope you can help me figure out the differences. @Claudia M: Thanks for your comment! They are two quite different types of product, although there is some overlap in terms of function. The Daily Reviving Concentrate is a face oil, and will have a very different texture and skinfeel from the Skin Rescuer. As it is an oil, it's primary purpose will be as a barrier on top of the skin, with some occlusive and emollient benefits. It will help to prevent further water loss from the skin which can make dry skin worse. For the Skin Rescuer, it is a moisturizer and won't have the same oil-like feel as the Daily Reviving Concentrate. It will also provide some emollient and occlusive effects, but it will also have some humectant benefits. Between the two, I prefer the Skin Rescuer, but you may have your own preferences :) Hope this helps!